So this review is long coming and I mean literally. Granted I still have the bottle that I am showing in the pictures, but its almost gone! 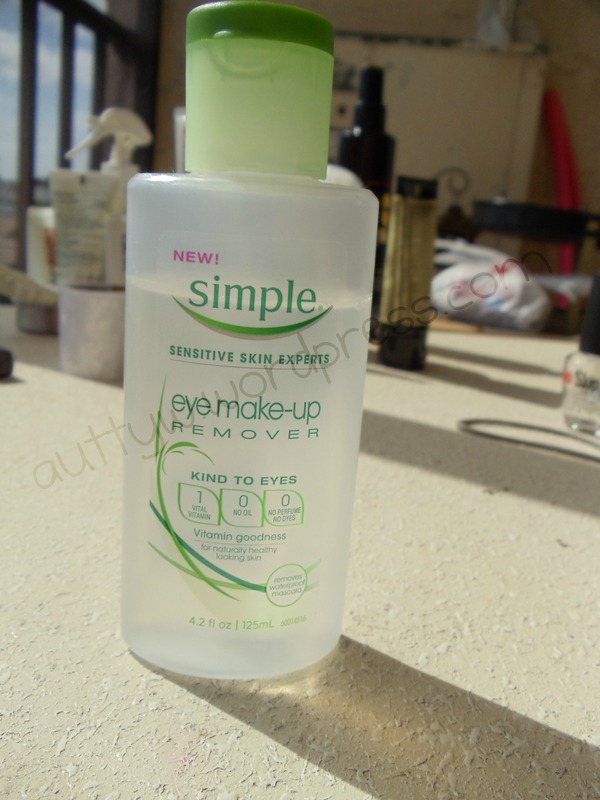 So the Simple Sensitive Skin Experts Eyemakeup Remover is actually to date my favorite eyemakeup remover. When I say favorite, I mean it. I've tried a whole host of different drug store brand makeup removers and they all burned my eyes like a mother (Almay I am talking to you) or they just didn't take my makeup off completely like it should. 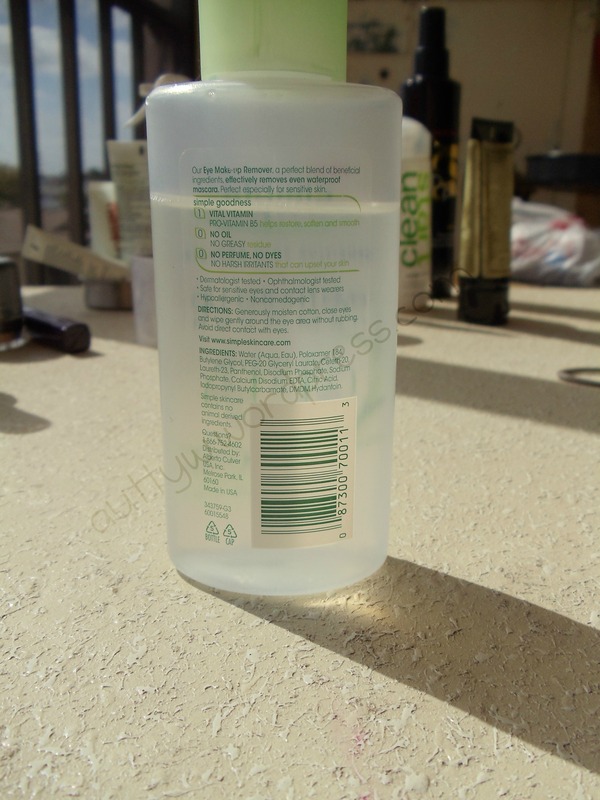 When I bought this bottle Simple was JUST popping into Targets all across the nation, so I was super excited and planned to have this review up MONTHS ago, but that never happened. :P I got this because my eyes have been sensitive as of late, which has become kind of annoying to me becasue I am not used to it. Now this is branded as the #1 skin care line in the UK, so I was even more intrigued to try it because of that. This has added vitamins (pro-vitamin B5), there is no oils, greasy residue, dyes, artificial perfumes or harsh irritants. It is also safe for contact lens users. Dertmatoligist and ophthalmologist tested. Hypoallergenic and noncomedogenic. You get 4.2 fl oz (125 mL) which is a pretty big bottle. It retails for around $6.99. (prices may vary depending on your location) Now, I bought mine at Target but you can also purchase Simple at CVS, Publix, Winn-Dixie, Walmart, Kmart, Super Target, and many MANY other places. Those are just the retailers near me that stock it. 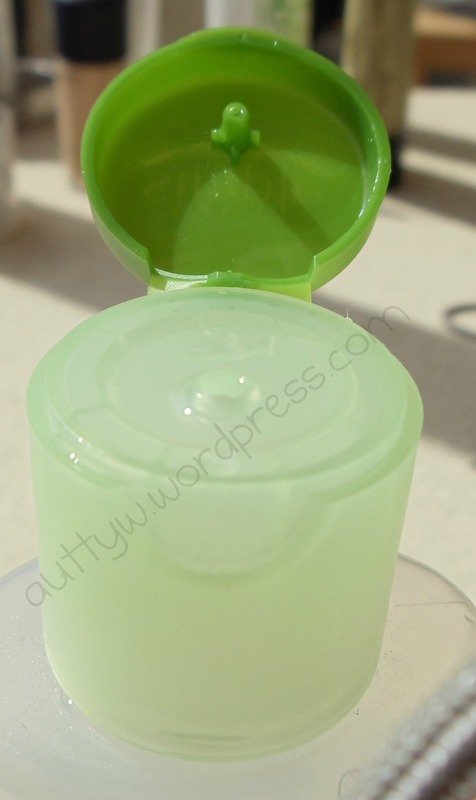 My only problem with this is after I use it, my lids becomes sticky. Not because of oils, of a greasy reside, because there is none of that on my lids. Im not sure why they become sticky to be honest. Its not a bad thing, it just tends to get a little annoying when you blink and your eye lid sticks. Its not a huge issue with me, its more annoying than anything. As you can tell, these are OLD pictures because they have my old wordpress link instead of just auttyw.com.